We've known that proper Xbox Live gaming (powered by XNA) was coming to Windows Phone 7 devices, but we'd yet to see any of that thumb-spraining goodness in action besides a brief demo and a few developer videos. Well, Microsoft has finally come clean with details about its launch strategy for the platform, and from where we sit, it's definitely looking pretty promising. First off, the company has announced a full list of launch titles for WP7 handsets, including some familiar names and franchises like Castlevania, Halo: Waypoint, Star Wars, Crackdown, and Guitar Hero, alongside a handful of newer properties like the ultra-cute ilomilo, produced in-house by Microsoft Game Studios. In total, the company will launch with over 60 game titles, with new offerings appearing every week in the Xbox Live Marketplace, just like its big brother console version. We've got all the details, a full list of the launch titles, and our hands-on preview after the break -- so read on to get the scoop! Besides just announcing some games today, Microsoft has also shown off the full feature set of Xbox Live integration in Windows Phone 7, and users of the service should be pleased to discover that there's not much missing from the version they know and love. 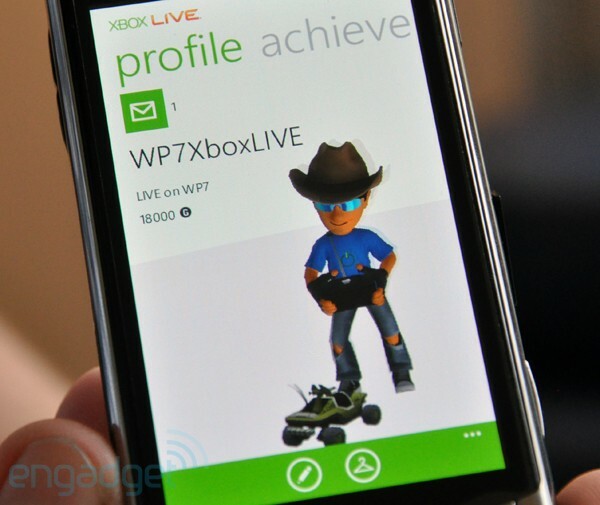 Live on WP7 will allow for full avatar integration (we're talking fully rendered, interactive avatars) along with customization (clothes, accessories, and more). The company has even crafted an avatar-centric version of familiar phone utilities like flashlight apps and levels, adding some whimsy to what would normally be pretty staid affairs. Additionally, messaging, friend lists / status, achievements, and leaderboards (with friend comparisons) are all here as well, making for a pretty complete mobile Xbox Live experience. And also just like the console, every game will have a try-before-you buy demo to check out before spending your hard-earned cash. We'll preface this by saying that both the hardware and software we demoed was still unfinished (the latter being the Samsung Taylor dev phone and the LG QWERTY model we broke news of on the Engadget Show). Regardless, the gameplay for the arcade titles seemed excellent, with frame rates holding fast even during graphically intensive 3D sequences (such as the chaotic, scattered-pixel play of Rocket Riot). The Harvest, while a bit familiar to our eyes, still showed the graphic promise of the platform. Gameplay was definitely well suited to a touchscreen device, though Microsoft's Kevin Unangst told us that developers could target controls for both touch and QWERTY-equipped phones (provided that a touch version was always present). The screen response seemed accurate and sensitive, reacting quickly to our input. Particularly in the Crackdown title -- a tower defense game "set in the Crackdown universe" -- pinch zooming, rotation, and finger tracking was excellent. Besides just standard gaming, it looks like Microsoft will try and leverage some other components of the platform. In the aforementioned Crackdown 2: Project Sunburst, the game utilizes Bing maps to create levels (not unlike the PSN title The Last Guy), and logic in the software is able to recognize things like roads for enemies to make their way down. A unique concept for sure, and the kind of thinking we hope we'll see more of on this platform. Though we didn't get to see a lot of titles (we particularly would have liked to see something like Castlevania), the polish and speed of the games we played was definitely competitive with iPhone or Palm Pre gaming. We didn't get a chance to peruse the Live Marketplace because the phones were offline, but we did get to play around with cached elements, and we felt right at home. Updating and tweaking your avatar was fast and straightforward, as was finding friends and checking up on achievements or messages. Unfortunately, for the launch of Windows Phone 7 there won't be any true multiplayer options besides turn-based games, though Kevin seemed to indicate that head-to-head gaming (whether over a local or wide network) was in the roadmap. It only makes sense considering this is Xbox Live we're talking about, and it seems like something that would have been baked in from the beginning. We may be a little spoiled from the variety of multiplayer titles on the iOS platform, but that was one knock against Microsoft here. One other small issue we noticed was that game load times seemed long -- a little too long. Again, Microsoft says things are still unfinished, so we're hoping this is a side effect of debugging and non-optimized builds. All in all, it's a promising picture for Microsoft. The company has the clout, the community, and most importantly the cash to pull this off, but as with all modern smartphone platforms, success can't be judged on one aspect alone. To make Windows Phone 7 really work, the folks in Redmond will have to hit the right note on not just gaming, but the basic user experience, hardware, applications, and carrier partnerships. Based on what we've seen of Xbox Live on these devices, we think the company can check at least one of those boxes off. Xbox LIVE is the online entertainment service for your Xbox 360, connecting you to an ever-expanding world of games, movies, TV, music, sports and social entertainment. Xbox LIVE lets you play the best games, enjoy the largest on-demand library on any console, listen to millions of songs and share the fun with friends around the world. This holiday season, Xbox LIVE will come to Windows Phone 7 and put the power of connected entertainment in the palm of your hand. Xbox LIVE is also the exclusive home of controller-free online entertainment through Kinect, making your Xbox 360 more intuitive and interactive than ever before. With an active community of 25 million people across 26 countries, expanding to 35 this fall, Xbox LIVE, together with Xbox 360 and Windows Phone 7, provides you with instant access to the entertainment you want, shared with the people you care about, wherever you are. More information about Xbox LIVE can be found online at http://www.xbox.com/live.